Superconductors.ORG herein reports the discovery of the first room-temperature superconductor (RTSC) that contains fewer than 10 atoms in its unit cell. 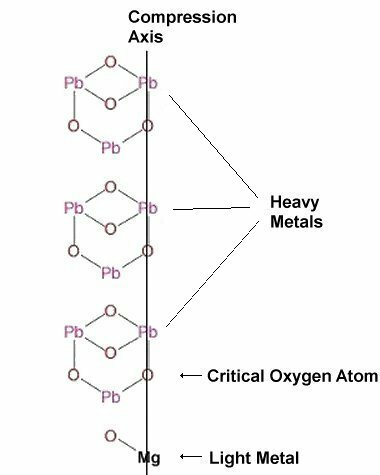 As with the previous 42 RTSC discoveries, Pb3MgO5 exploits a high planar weight ratio (PWR) to generate periodic compression of the oxygen atoms that are positioned between heavy and light metals. Based on a Meissner transition of 6 milligauss, the volume fraction (VF) appears to be around 2 to 3% of the bulk. 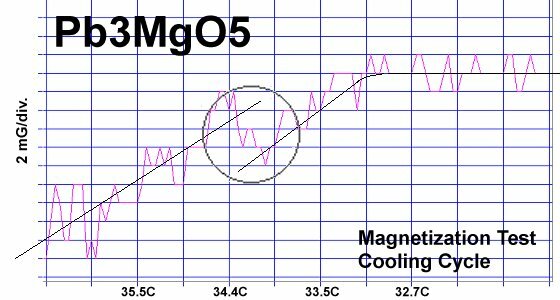 Other minority-phase transitions were observed at higher temperatures. So the total VF of room-temperature material is slightly greater. Previously the most efficient unit cell that would produce RTSC was Cd5MgO6, which contained 12 atoms. At page top are two of over a dozen magnetization tests that were performed on this material. The critical transition temperature (Tc) is near 34 Celsius (93F) for the majority phase. Lines have been drawn through the noise to illustrate the diamagnetic shift at Tc. Lead (II) oxide was chosen to bond with magnesium oxide due to its high PWR and +2 oxidation state. Divalent metals of disparate weights have produced the best superconductor results in the past. This is because they form collinear structures, which produce the most direct compression of interposed oxygen atoms. However, lead-oxide has two different structures that form. The yellow PbO precursor is orthorhombic. 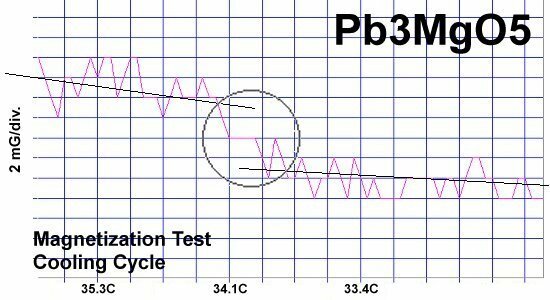 After heating, yellow PbO changes to red Pb3O4 and takes on a tetragonal structure. This is indeed what was observed after annealing. The pellet interior had become red, despite being mixed with magnesium. The structure at left illustrates how Pb3MgO5 is likely fleshing out. In the below graph Tc is plotted against PWR. 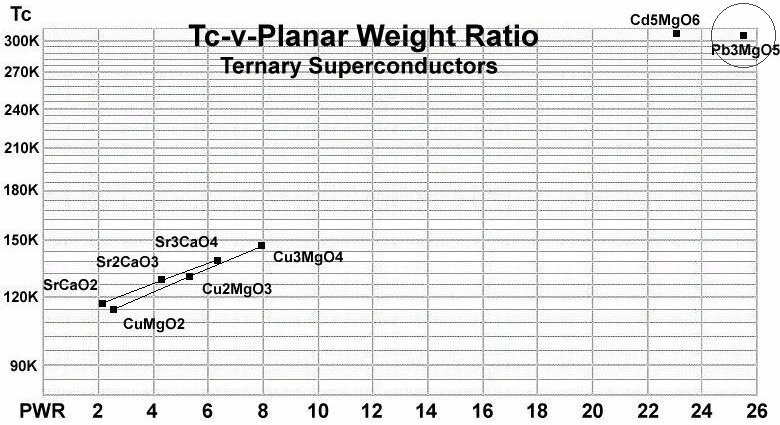 At 307K this new material's Tc closely follows the curve of other ternary superconductors that have a tetragonal structure. The chemical precursors were mixed, pelletized at 60,000 PSI and pre-sintered for 10+ hours at 855C. Then sintering lasted for 11+ hours at 880C. After sintering the pellet was annealed for 10+ hours at 500C in flowing O2. Testing temperatures were determined using an Omega type "T" thermocouple and precision OP77 DC amplifier. The magnetometer employed twin Honeywell SS94A1F Hall-effect sensors with a tandem sensitivity of 50 mv/Gauss.